A woman and child rest in the open outside a destroyed building Sunday, a day after a major earthquake destroyed homes in Kumalpur village on the outskirts of Kathmandu, Nepal. Nine people reportedly died in the small village, including four children. 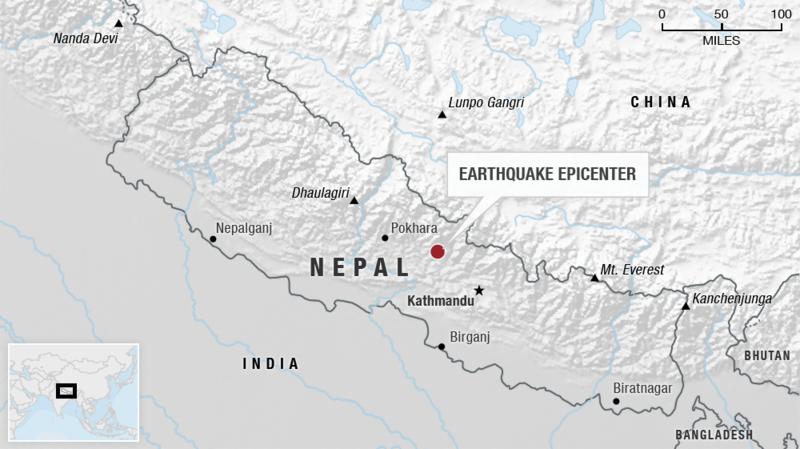 Updated April 28, 7:38 a.m.
Nepal&apos;s devastating earthquake that hit Saturday is now blamed for at least 4,000 deaths. Reconstruction is estimated to cost billions. International aid efforts are underway, but aftershocks are rattling survivors&apos; nerves and making the recovery even more challenging. Rescue crews and aid groups are working to reach survivors — but their efforts are being hampered by the stricken areas&apos; remote locations. Roads that are drivable are clogged with traffic. In one district, 400,000 people were affected by the quake and more than 4,000 homes are now unsafe to inhabit, NPR&apos;s Julie McCarthy reports. From Kathmandu, Julie says many residents are both angry that more wasn&apos;t done to reinforce Nepal&apos;s structures against earthquakes and afraid that further tremors might bring more destruction. "Until these aftershocks settle down, people will be terrified of them. News of them just consumes their conversations," Julie tells Morning Edition. She adds, "People tell me they&apos;re afraid even to go back into their homes to grab a blanket." The quake also triggered a massive avalanche that buried climbers at the Mount Everest base camp. Helicopter crews have been working to get climbers off the mountain. From the Nepalese capital, NPR&apos;s Kirk Siegler reports on the search and rescue effort in the Himalayas. Two of Nepal&apos;s biggest international supporters, the World Bank Group and the Asian Development Bank, say they&apos;re ready to help the recovery effort. The ADB said Monday that it is sending $3 million for immediate aid, promising an additional $200 million to help start rehabilitation.